By Primary 3 and 4 Chirnsyde Primary School, Scotland. 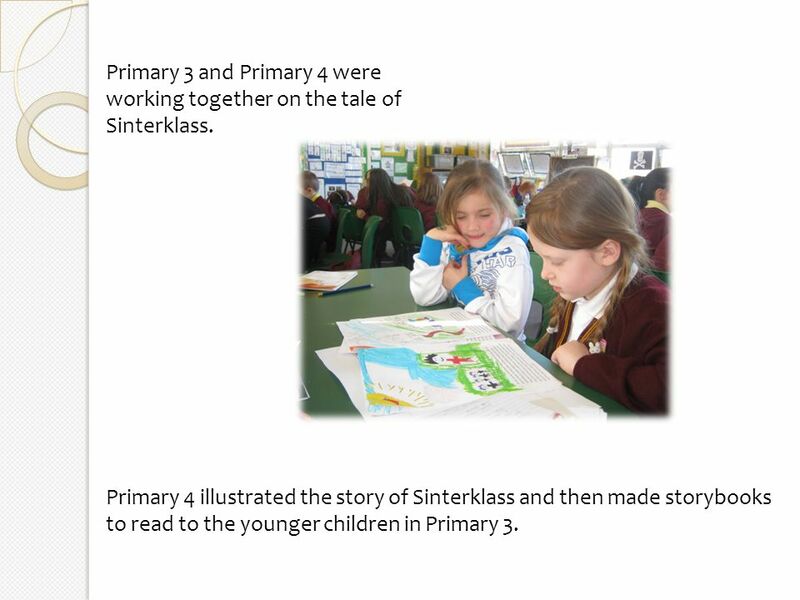 2 Primary 4 illustrated the story of Sinterklass and then made storybooks to read to the younger children in Primary 3. 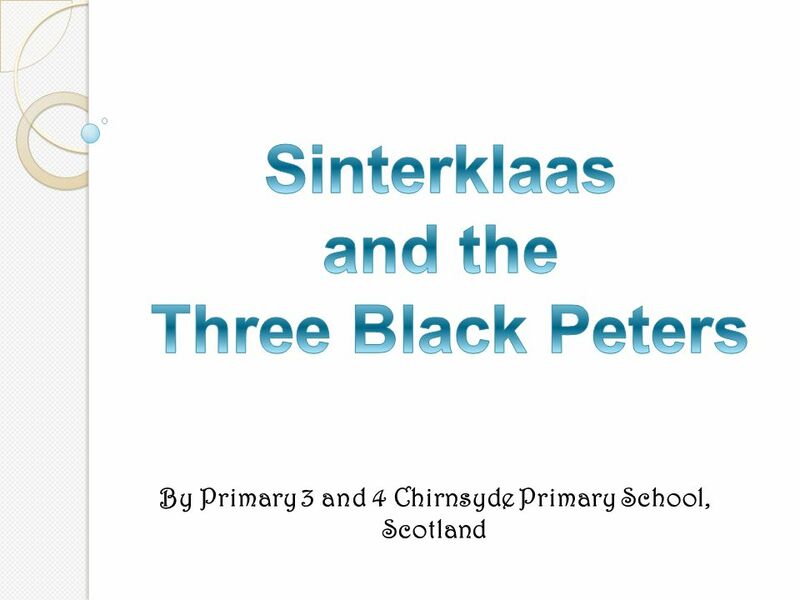 Primary 3 and Primary 4 were working together on the tale of Sinterklass. 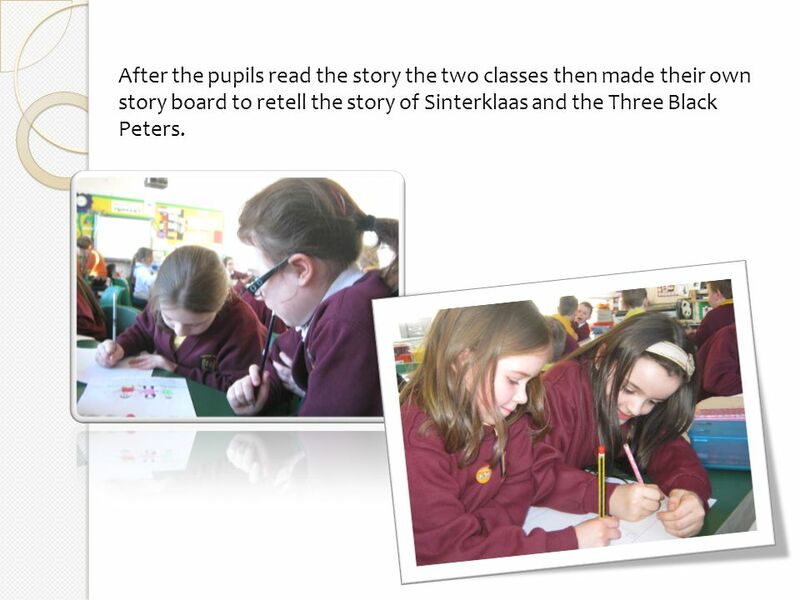 3 After the pupils read the story the two classes then made their own story board to retell the story of Sinterklaas and the Three Black Peters. 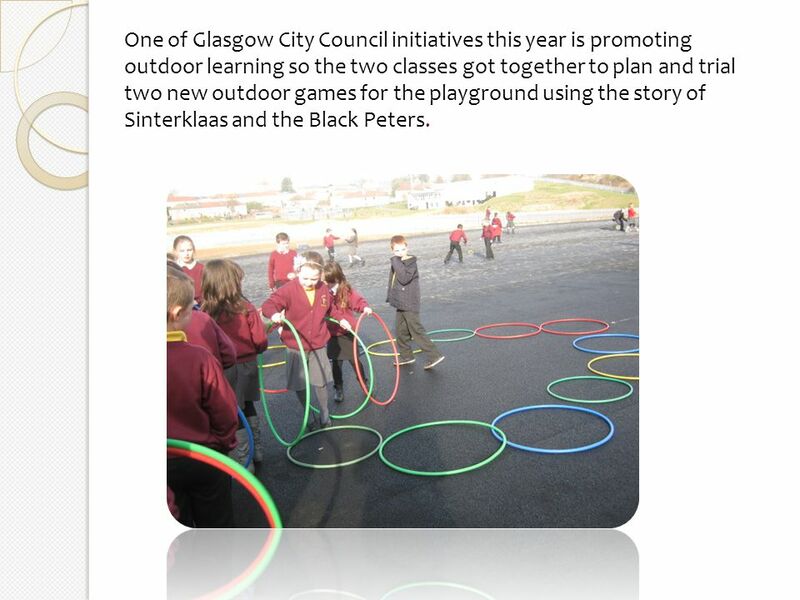 4 One of Glasgow City Council initiatives this year is promoting outdoor learning so the two classes got together to plan and trial two new outdoor games for the playground using the story of Sinterklaas and the Black Peters. 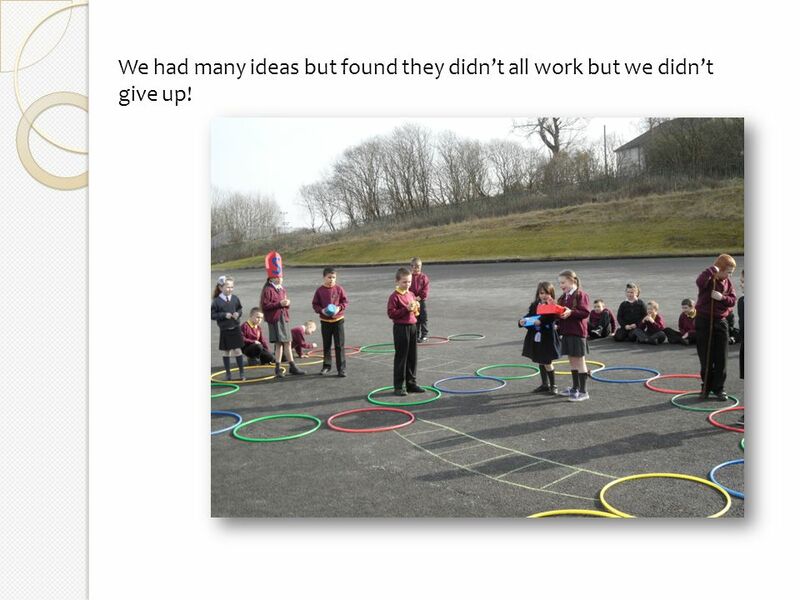 5 We had many ideas but found they didn’t all work but we didn’t give up! 6 Eventually we had a game we were really pleased with. 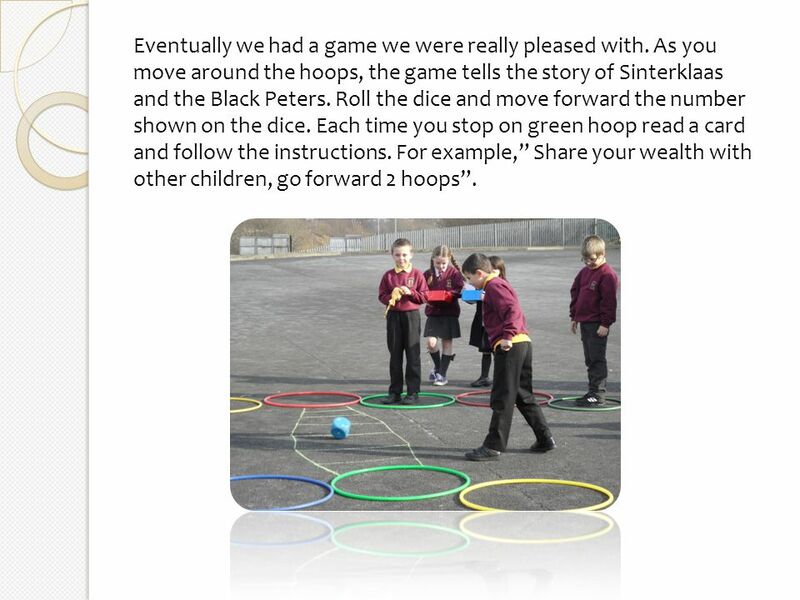 As you move around the hoops, the game tells the story of Sinterklaas and the Black Peters. Roll the dice and move forward the number shown on the dice. Each time you stop on green hoop read a card and follow the instructions. For example,” Share your wealth with other children, go forward 2 hoops”. 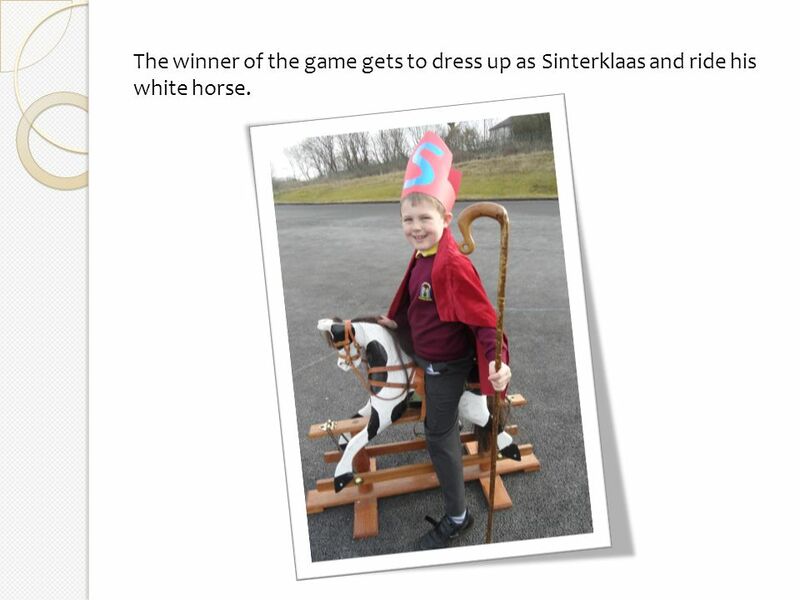 7 The winner of the game gets to dress up as Sinterklaas and ride his white horse. 8 Sinterklaas tig...the Scottish way! 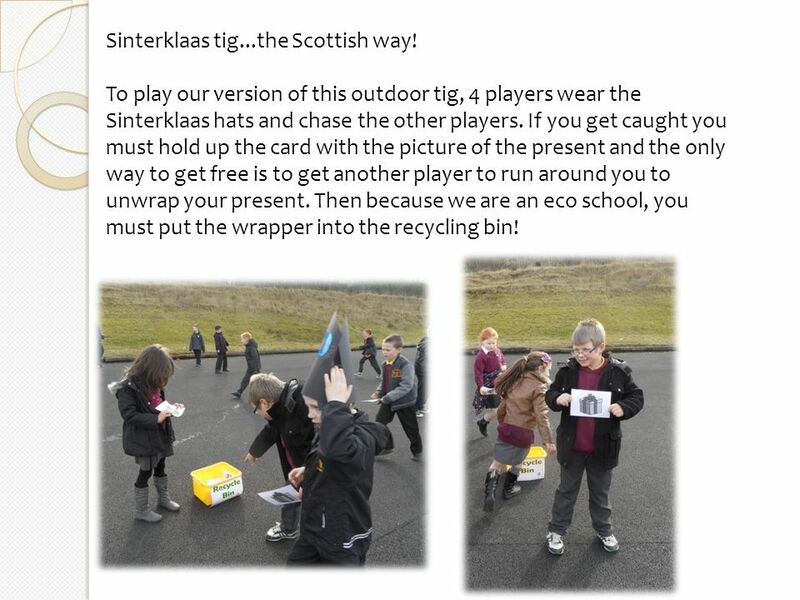 To play our version of this outdoor tig, 4 players wear the Sinterklaas hats and chase the other players. If you get caught you must hold up the card with the picture of the present and the only way to get free is to get another player to run around you to unwrap your present. Then because we are an eco school, you must put the wrapper into the recycling bin! 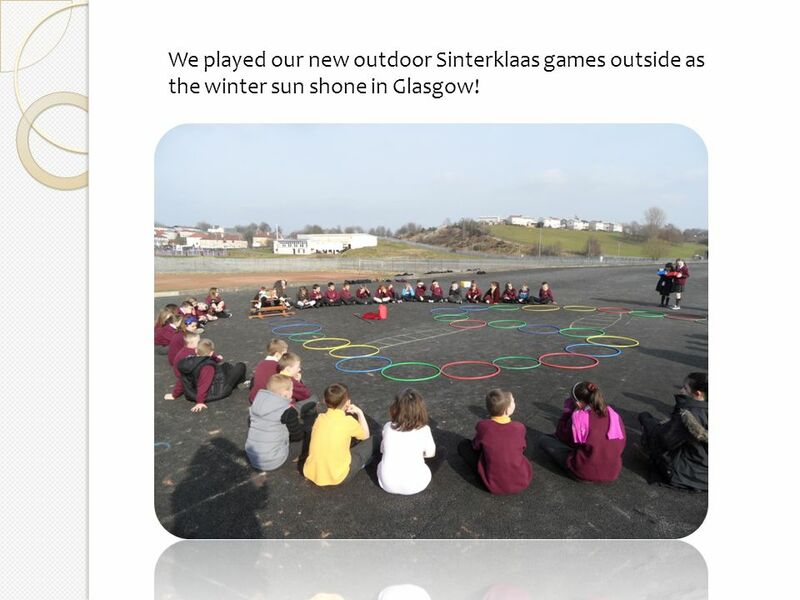 9 We played our new outdoor Sinterklaas games outside as the winter sun shone in Glasgow! 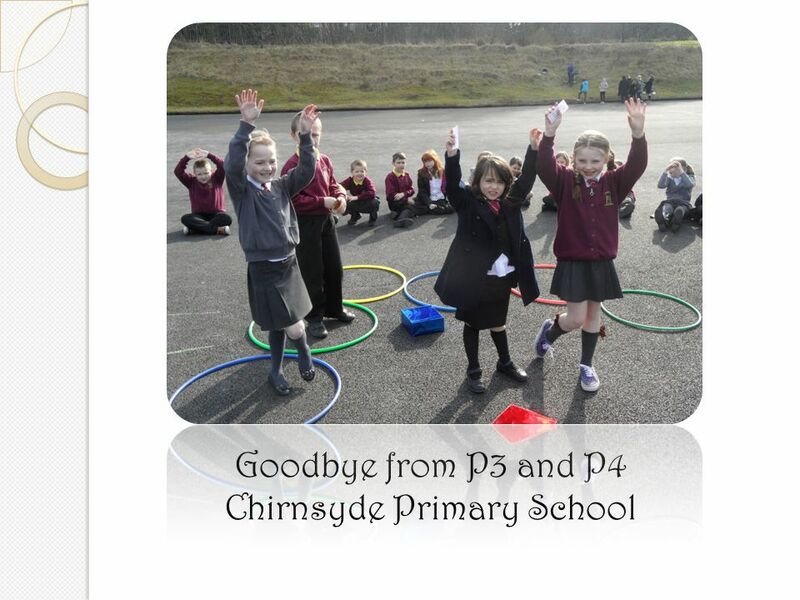 Download ppt "By Primary 3 and 4 Chirnsyde Primary School, Scotland." Hollands Christmas Traditions By Molly Ashworth. Sinterklaass Arrival On the 16 th of November Sinterklaas arrives in Holland on a boat with his helper. The third day of my stay in Texas, we made a trip to Fort-Worth. I had no idea, what was on there. Nearby Fort-Worth we stopped, becouse someone would. A Book Report by Trenton Characters The characters in this story are there soccer coach, Peter a good soccer player, Berk a very good goal keeper, and. Lead Teacher Term Four Fractions 11/12 November 2011. St Bride’s Primary Playground Games Inspired by Pieter Bruegel’s painting “Children’s Games”. Serena’s 10 Tips to Caldecott Recognition Serena Chidester Educ. 316 Children’s Literature 05/02/05. NETHERLANDS CHRISTMAS. HISTORY OF CHRISTMAS IN NETHERLANDS Netherlands St. Nicholas [Santa]is known as Sinterklass. He dresses in traditional bishop’s.  What do you need: a small ball and flash cards of European countries  Instructions: Play the game into two groups. One pupil from each group picks. Comments about using Internet in a teaching situation. The Internet helps me find creative and artistic ways to carry out my lessons. It serves as my “open. Hello from Kelbourne Park School. This is our main school building. Thinking is at the heart of Mathematics and therefore should be at the heart of mathematical teaching and learning.